Professor Timothy Mousseau received his doctoral degree in 1988 from McGill University and completed a NSERC (Canada) postdoctoral fellowship in population biology at the University of California, Davis. He joined the faculty at the University of South Carolina in 1991 and is currently a Professor in the Department of Biological Sciences in the College of Arts & Sciences. He was elected a fellow of the American Association for the Advancement of Science (AAAS) in 2008, a Fellow National of the Explorers Club in 2009, and a member of the Cosmos Club (DC) in 2011. He was awarded both the President’s Appreciation Award and the Faculty Award from the national Black Graduate Student Association (BGSA) in 2011. He was awarded a fellowship from the American Council of Learned Societies (ACLS) in 2015 to study the history of the Chernobyl disaster. Dr. Mousseau has published over 190 scholarly articles and has edited two books, Maternal Effects as Adaptations, 1998, with Charles Fox and Adaptive Genetic Variation in the Wild, 2000, with Barry Sinervo and John Endler, both published by Oxford University Press. He is currently co-editor (with Charles Fox) of the annual review series, The Year in Evolutionary Biology, published by the New York Academy of Sciences. Mousseau and his students have worked on a wide diversity of organisms, from bacteria to beetles to birds, and his primary areas of research interest include the genetic basis of adaptive variation, and the evolution of maternal effects. Since 1999, Professor Mousseau and his collaborators (esp. 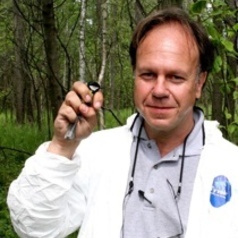 Dr. Anders Pape Møller, CNRS, University of Paris-Sud) have explored the ecological and evolutionary consequences of the radioactive contaminants affecting populations of birds, insects and people inhabiting the Chernobyl region of Ukraine, and more recently, in Fukushima Prefecture, Japan. Their research suggests that many species of plants and animals experience direct toxicity and increased mutational loads as a result of exposure to radionuclides stemming from the Chernobyl and Fukushima disasters. In many species (e.g. the barn swallow, Hirundo rustica), data suggests that this mutational load has had dramatic consequences for development, reproduction and survival, and the effects observed at individual and population levels are having large impacts on the biological communities of these regions. Dr. Mousseau’s current research is aimed at elucidating the causes of variation among different species in their apparent sensitivity to radionuclide exposure.